Click the button below to add the Kung Fu Rider (PS3) to your wish list. What do office chairs and the Chinese Mafia have in common? Kung Fu Rider. Kung Fu Rider is a fast-paced, arcade-action game for PlayStation 3 that combines a comically off-the-wall in-game movement mechanic with the motion-control technology of the PlayStation Move system to create a gameplay experience not to be missed. Along with addictive fast-paced gameplay, additional features include a two-player co-op mode, 20+ game levels, PlayStation Network support and rankings, multiple ridable office chairs and more. Toby and his drop-dead gorgeous assistant Karin run a detective agency, but when the mob inexplicably comes calling they become the hunted and have no choice but to hightail it out of trouble on the only means of transportation available, their office chairs. Catapult through the wild, untamed city streets of their megalopolis as you use the PlayStation Move motion controller and PlayStation Eye camera combination to slingshot forward, smash through crowds of pedestrians, lock in air defying combo chains and karate chop your way to safety. Experience the heart pounding rush as you control the duo on a crazy getaway from the mob. Ride your way to safety, grasping onto your PlayStation Move motion controller to stay in control as you steer, jump, dash at breakneck speeds. Kung Fu Rider utilizes the PlayStation Move motion controller and PlayStation Eye camera peripheral combination (both sold separately)* to place players in the hotseat as they take on the role of the office chair dependent Toby or Karin. 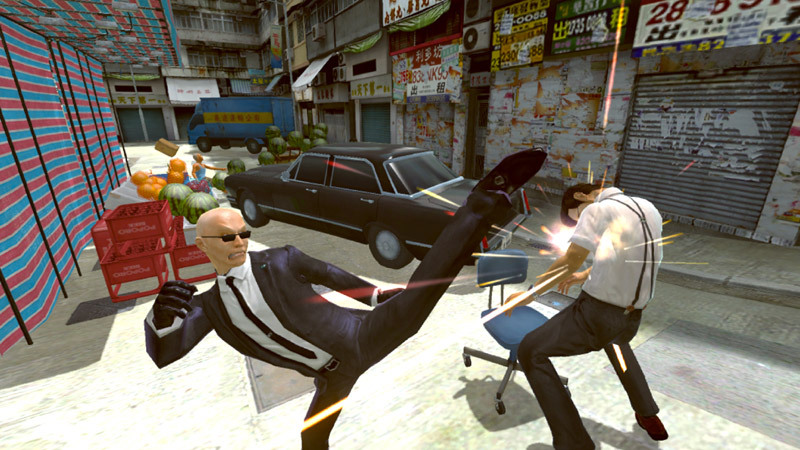 Gestures made with the Move motion controller are translated by the PlayStation Eye into everything from kung fu attacks used as defense against pursuing mobsters, to jumps and speed bursts needed to outrun them or manoeuvre and grind through the more than 20 game levels included in the game. The game contains a two-player co-op mode, and along the way players will discover secrets hidden within the city, as well build up online ranking and wrack up trophies. Equipped with a three axis gyroscope, a three axis accelerometer and terrestrial magnetic field sensor, the PlayStation Move motion controller tracks the precise movements and the angle of the controller, while the PlayStation Eye camera, aimed at the player, allows the PS3 system to detect the absolute position of the controller in 3D space. Together this facilitates the highly sensitive movement tracking and intuitive gameplay that gives the impression that the player is physically within the game. The PlayStation Move motion controller also features the familiar PlayStation controller button orientation, for seamless play from the very first use.